Tokyo, Japan, October 23, 2012 — Teijin DuPont Films Japan Limited announced today that it has developed a high-performance polyester film that achieves the world’s highest level of protection from ultraviolet (UV) light. The film is expected to be launched commercially in fiscal 2013 and sales of 2.5 billion yen (31.5 million USD) are envisioned by fiscal 2020. Protective films for electronics materials are expected to be the primary application. The new film incorporates Teijin DuPont Films’ unique technologies for UV absorption agent, and blocks UV radiation up to 390nm, or nearly 100% of all harmful ultraviolet light. Visible light, however, is transmitted at a rate equivalent to or greater than that of conventional films. Until now, the rate of visible light transmission has decreased as UV cutoff performance is increased in conventional films. UV cutoff properties are incorporated in the film itself, so there is no need for additional coating as required with conventional films. Since impurities generated during coating are eliminated, the new film’s production generates just one-tenth the amount of impurities compared to conventional film production, thereby helping to reduce overall costs. 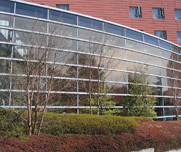 UV cutoff films are used for window glass and films protecting electronics materials. The demand is expected to grow for the protection of high-performance devices such as organic electroluminescent (EL) devices, electronic paper and other next-generation devices, as well as polymer conductive materials in next-generation solar cells and organic semiconductor materials.